An aging hero experiences a mid-life crisis when he realizes he has never quite “made it” as a superhero. Meet CRISIS: 45-years old…an age where most heroes have hung up their capes. But Crisis is experiencing his midlife crisis. He’s desperate for validation. Jess Williams (aka Crisis) isn’t a bad guy or even a half-bad superhero. He’s busted crime rings, thwarted villains, and done community service. Crisis recognizes that his superhero days are almost over. Despite his wife’s assurances, Crisis knows the truth. He never really made it. He’s frustrated, depressed, and angry. And looking for a big career comeback. 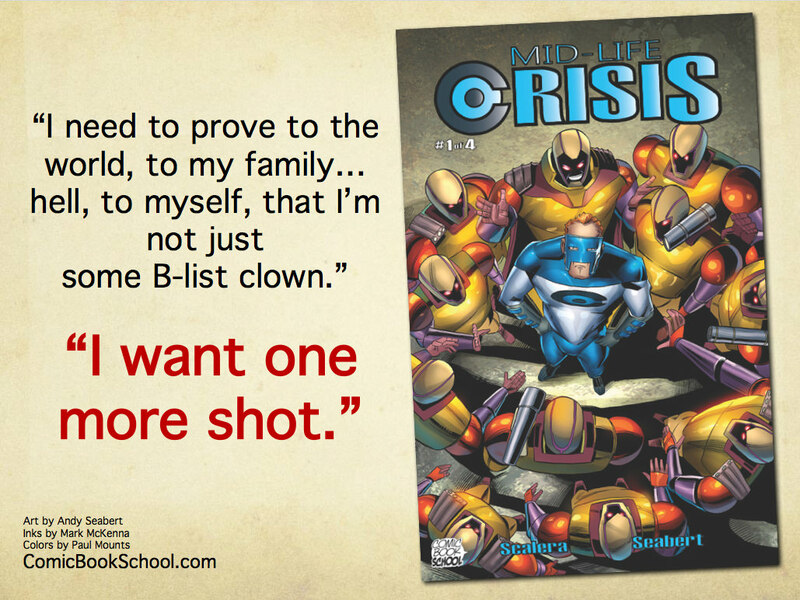 In a desperate attempt to prove himself, Crisis puts his life, his secret identity, and the fate of the world on the line. Audience: People who enjoy intelligent superhero stories with a modern twist. Check out the Mid-Life Crisis Script, Pencil, Ink, and Color gallery.